Spring has arrived! I'm embracing the season change with a decor switch up. 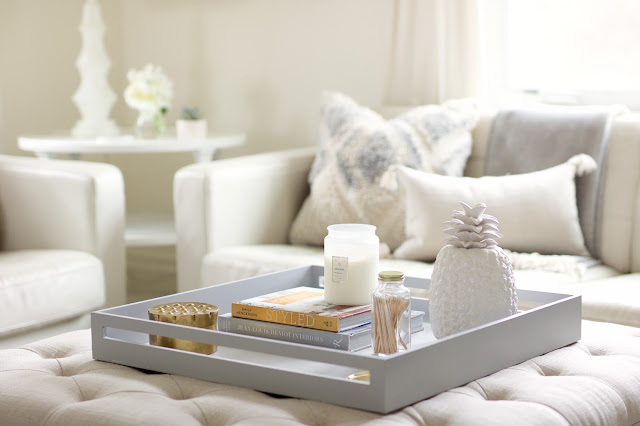 Taking the time to edit winter interiors and incorporate spring elements is easier than you'd think. 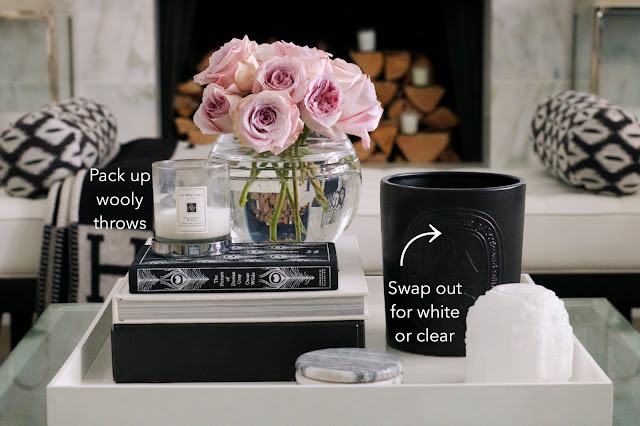 It's as simple as swapping out heavier accessories for those with a lighter, airier, fresh aesthetic. (1) One of my favourite ways to create a sense of spring, and perhaps the most literal, is with the introduction of live elements, such as fresh flowers or bulbs. If you don't usually buy yourself flowers it doesn't need to cost an arm and a leg. Grocer's tulips are cheerful and abundant. 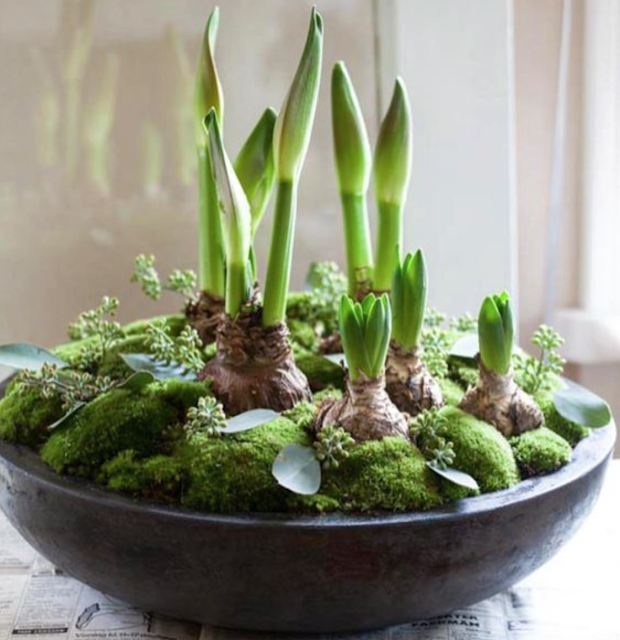 Forcing bulbs is also an inexpensive and thoroughly enjoyable way to breathe spring into a space. Bulbs are typically very aromatic and can last for much longer than cut flowers and add a pop of colour to otherwise dull interiors. (2) Scents have a tremendous impact as well. I have several rich, spicy candles that I get out in the fall. I pack them up and swap out new ones at this time of year. Treating yourself to a fresh floral, or bright citrusy candle is such an easy way to ring in spring. In the kitchen and bathrooms, a fresh new liquid soap does wonders too. (3) Another quick change is to edit out heavy textures and dark elements like faux furs, velvets and woolly throws in favour of brighter, lighter weight textiles. Switching cushion covers and blankets is perhaps one of the easiest ways to visually lighten up a space. (4) Area rugs are a consideration too. Something thick, warm, and plush brings comfort underfoot when it's cold outside. I look forward to rolling up the winter area rug in favour of a sisal or sea grass one every year. It feels reminiscent of the beach and more tropical interiors. (5) Many of my favourite winter accessories are heavy and opaque porcelains and metals… things such as vases, candle holders, etc. 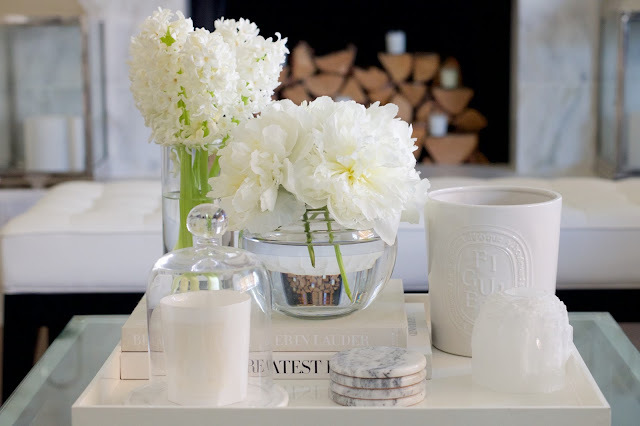 Incorporating elements such as clear glass vases, and lighter semi opaque glass touches will also lighten a space. It all works together when there's a common tying visual cue, like the layering of gold elements. (6) Last but not least, you can take a look around your house and switch out any darker colour tones for lighter shades. I was amazed at how many things I found to switch out... black kitchen towels in favour of white striped turkish hand towels. I swapped a dark grey shower curtain and bath matt in favour of white ones. 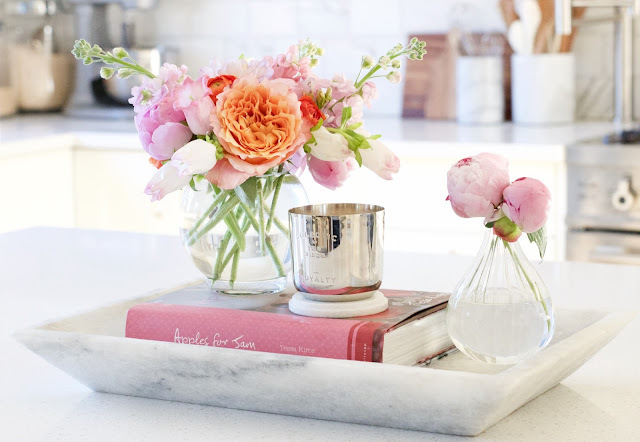 Do you have a tried and true way to usher spring into your home? 1. Make organization of seasonal accessories easy by storing out of use elements in a labelled plastic bin. This will aid in the ease of switching decor up when the seasons change. 2. Keep a photo journal of your favourite decor set ups stored on your phone or iPad. Recreating vignettes will be easy with a visual prompt. 3. Always properly clean and repair decor elements before storing. There's nothing worse than going to get your favourite throw blanket and realizing that it has a stain from last spring. 4. Clean the dust off fall candles with dampened soft cloth and trim the wick. This will make unpacking a breeze in the fall. Spring is time for a change! I love your ideas! You have beautifully decorated your home, these accessories and fotele are unique. I love seeing how you change things up in your home as the year moves along.